Are you using campaign lead or customer lead marketing? This week I’m going to build on a recent post (“Why customer segmentation is not customer strategy”) by looking at a new approach to creating a customer strategy. We will start by examining how most marketing departments use customer segmentation. Over the past 10-15 years, an evolution, a good evolution mind you, has overtaken marketing organisations. In that time, there has been an increased focus on maximizing the return on marketing investment. Through improved data and analytical software, organisations have constantly increased their campaign return on investment. One of the tools that they have used to do this is customer segmentation. A high level view of the overall marketing process and how segmentation fits is shown below. Starting with the company’s business goals, organisations create marketing plans to meet those goals. The marketing plans then take into account product opportunities, high level customer needs analysis and a range of other company specific attributes to create campaign ideas that are turned into campaigns. The next stage of the process is critical in driving up campaign ROI: the campaigns are matched with segmentation data to find the customers that are most likely to respond to the campaign. This matching process often uses past campaign/ segment performance as a guide in the matching process. Lastly, the campaign is run. The customer segmentation is used to extract a list of customers to whom the campaign will be sent. The list is then passed through a range of exclusion rules. These rules can be as simple as a “do not contact flag” or “never contact more than once every 60 days”. The final list is then merged with the campaign creative details (call script, direct mail piece, e-direct mail, etc) and sent out. This process can be used to deliver a campaign with a very high return on investment but it does have it’s problems. 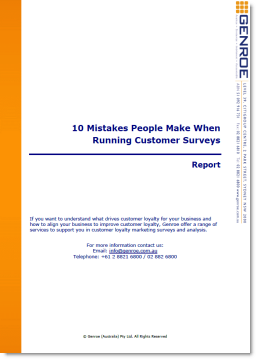 It seems that the same 20% of customers end up in almost all of the campaigns. This is the 80/20 rule at work. All of the A/B demographic customers seem to be dragged into all of the campaigns. Campaign results are tactical feedback in that the organisation can optimise the campaign but it may not be optimizing the value of the customer or business. A different, and I would say better, approach is to rather start with a customer strategy and work down from there. That way you are optimising the value of the customer and business while also maximizing the campaign ROI. Below is a strategy approach, the blue boxes are the changes from the original approach. This is a completely different approach that builds trust and value in the customer relationship rather than destroying it. Using this approach (a customer strategy and customer life-cycle approach), the customer is taken on a planned journey starting at the time they become a customer and take up their first product. The campaigns/messages they receive are pre-planned and event based triggers. At a campaign level, the result is a larger number of smaller, targeted campaigns offering higher ROI. It is at the business level that the real value is found. Using this approach you maximise the overall customer lifetime value. It is true that in order to implement this approach you need a way to develop and assign a customer strategy to each customer. In our experience a customer value map is the easiest and most direct route to creating a tool that can be used to assign a customer strategy to each and every customer.